Dessben began his DJing in Madrid at the end of the 90s and was pretty soon was to be heard in many of the clubs and events of Spain. Clubs like Yasta, Specka, Base, Naru, Zeusas as well as the Electrosonic Festival and Womad. Sharing sessions with artists such as Mark Broom, Cristian Varela, Oscar Mulero, Takaaki Itoh and Sebastian Kramer as well as countless others. As far as netaudio goes, Dessben and his label are pretty important. 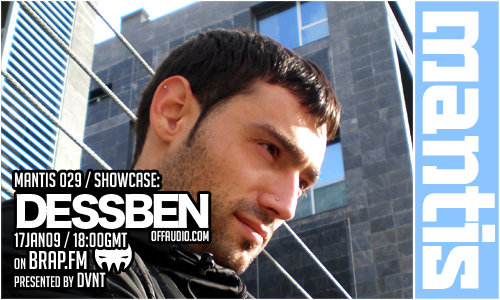 In 2004 he founded Offaudio, which is arguably one of the best Techno netlabels on the internet. His way of understanding Techno music is based on experimentation and the searching of new textures and sound structures. Aiming to be far from the dance music or the classic techno tradition and to be marked in a clear and personal style, full of risky, curious and hypnotic sounds. With 7 releases on his Offaudio label and 2 on Antiritmo as well as various remixes he’s a name that should be cropping up more and more in people’s playlists. You’ve only got to check previous DVNT charts to see his influence. His participation in the world netlabel scene is wide and his works can be found in many livesets and mixes of artists all over the world from labels like Zimmer-Records, Loopzilla, SonicWalker and Mixotic.